Die Hard with a Vengeance teaser poster (1995) | 'TAIN'T THE MEAT… IT'S THE HUMANITY! Die Hard with a Vengeance was released in 1995 and was the third film to feature Bruce Willis in his breakout roll of reluctant hero John McClane. The first film, Die Hard (1988), was such a monster hit that a sequel was inevitable. Although that film, the Renny Harlin directed Die Hard 2 (1990) was a box office success it had it’s detractors who criticised the movie’s over-the-top action sequences and McClane’s seeming indestructibility. When a third film was green-lit the producers wisely handed the reigns back to the director who had made the first film such a huge success: John McTiernan. McTiernan brought the film back to its roots, depicting a far more vulnerable McClane in a race against time to defeat Jeremy Iron’s villain, with Samuel L. Jackson along for the ride. The film was the most successful of the three raking in over $360m, making it the highest grossing film of 1995. The teaser poster released to promote Die Hard with a Vengeance featured a photo of a dirty and wary McClane (wearing his trademark vest, natch) against a back drop of explosions and the New York skyline. 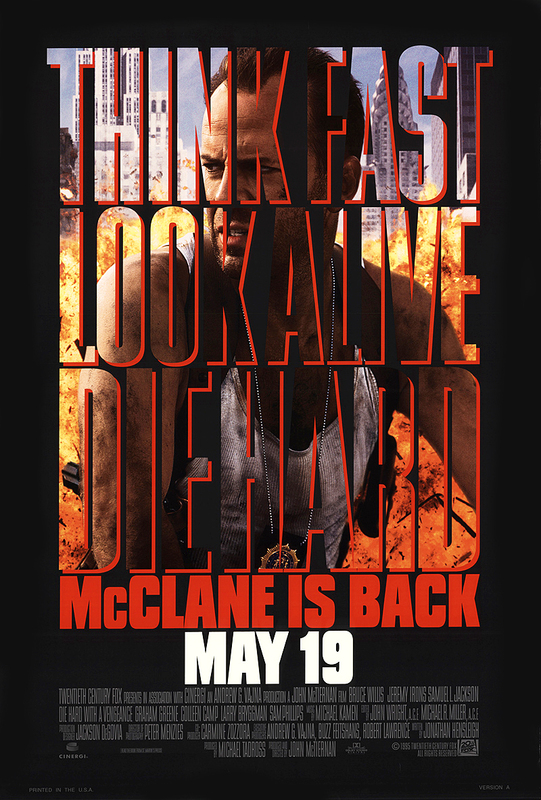 The image is pasted inside the film’s tagline: Think Fast, Look Alive, Die Hard, and underlined with the legend ‘McClane is back’, along with the film’s US release date. The poster doesn’t even feature the film’s actual name — classic teaser poster. It’s a very simple image yet hugely effective and ranks as one of my all-time favourite teasers; I bought a copy from The Cinema Store (now sadly closed) in London’s West End in early 1995 and it’s been hanging framed on my wall ever since.